Each season has its own beauty. My favorite season is spring. I can finally open my windows to let in the fresh, (relatively) clean air. I can step out into the warm sunlight without bundling up in coat, boots, hat, mittens, and scarf. I think what I like best about spring is growing things. New life! 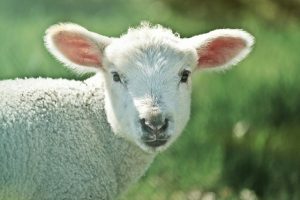 Around Easter time we often think about baby chicks, baby bunnies, baby lambs. Christians celebrate Easter as a time when Jesus died for our sins and rose again so that we can have new life spiritually. Have you watched the trees as they bud and noticed not just green but shades of green and sometimes red? Have you sniffed the air for the scent of lilacs and apple blossoms? Have you witnessed how, after a shower and the sun comes out, everything appears brighter and fresher. 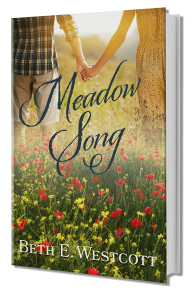 The wildflower meadow in my novel Meadow Song was derived from one of my childhood memories. I grew up in a rural, farming community in upstate New York. Nature abounded. One of my favorite places was what we called the clover field, a hayfield. 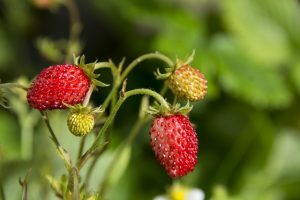 Surrounded on three sides by trees that turned brilliant colors in the fall, and beside an apple orchard that produced abundantly, I remember picking wild strawberries on the perimeter of the field. Wild strawberries like to hide beneath the leaves and grass. They’re tiny, and a special treat. 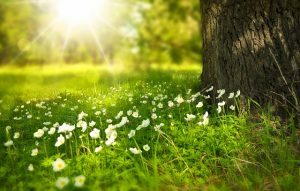 I remember the scent of the grass and the warmth of the sun. I like to write about nature. My characters notice things like gardens, the air they breathe, the weather, the sun, moon, and stars. I often include farm animals in books I write for my grandchildren. 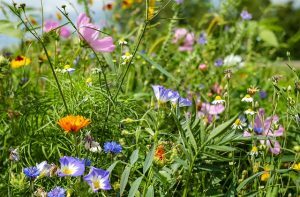 Meadow Song begins in the spring, a time of new beginnings. Kate has just come through a winter of sorrow. The meadow, Blythe Chambers, and Blythe’s uncle Jack are like that breath of fresh air though a newly opened window for Kate. Even the best of times are interrupted by storms. When we weather the storms, we come out stronger.